Windows 7 most productive feature on the desktop is the JumpList, that lets users access frequently used applications from the Windows SuperBar.Windows 7 Jumplist launcher lets you create jumplists in Windows 7 easily from a easy to use interface, with customization and reordering of programs/files in the jumplists. 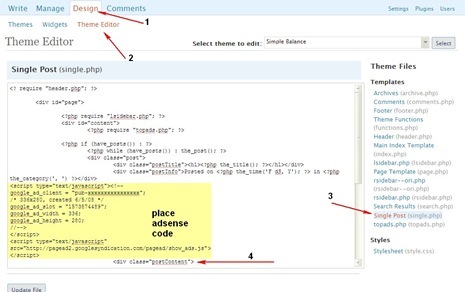 It lets you add up to 60 programs or files within self-defined groups inside a jumplist. 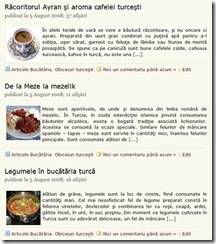 Lets user choose one default-entry which will be opened when clicked on Jumplist-Launchers Superbar-icon. 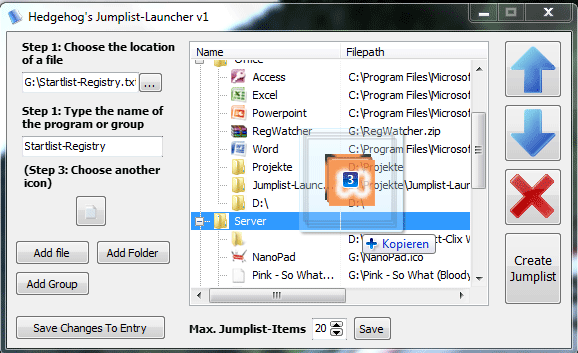 After creating the jumplist, the Jumplist Creator program need not run in the background.Files can be dragged and dropped into the Jumplist-Launcher from Windows-Explorer and Jumplist-items can be added by dragging single files on Jumplist-Launchers taskbar-icon while holding the shift-key. Note : The setting Max. 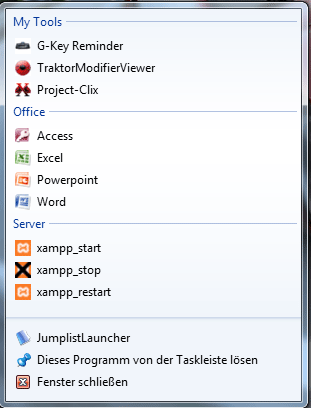 Jumplist-Items changes the number of possible entries globally for the whole Windows-environment).